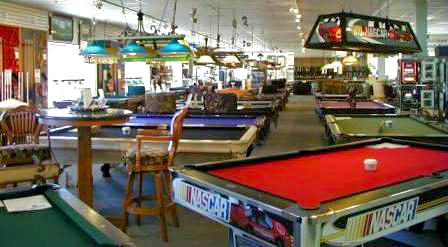 A view of pool tables from five great brands. Make it easy on yourself: just shop at Seasonal Specialty Stores! Seriously, though, we do take billiards seriously. We are a full time, year-round retailer of professional quality billiard tables. We sell every major billiard line in the United States: Brunswick, Olhausen, Proline, Legacy and Imperial. Our service and installation technicians have over twenty years experience. They are factory authorized to service every major brand. Installing, servicing and repairing pool tables is what they do for a living. It’s not just a side-job. It’s their profession. They are adults. We are supporting members of the Billiard Congress of America – the game’s primary governing body. Almost every table that we install is automatically BCA regulation (or can be made so for about $100 extra). If you want something “special” in style, service, quality, selection, etc., we’re ready and capable to help you. If you want a particular cloth (Simonis, Mali, Forstman, Olhausen, etc.) it’s not a problem. Billiard rails, snooker pockets, inlaid exotic woods, weatherproof construction, matching furniture (or a table to match your existing furniture), decorating or design service – we can do it. We usually have twenty to thirty different tables set up in our store with slate, pockets, and cloth; for you to try before you buy. You can decide for yourself if your table will perform up to your standards. We also have tables on display which are partially built so you can see why some tables perform better than others. We are clearly the best place to shop – so just shop right here!